I am 5 days out from the Scotiabank Toronto Waterfront Half Marathon and filled with anticipation and nerves. Training has had its ups and downs as expected. I knew that not every run was going to be a good run and that the last 6 months was going to be intense and challenging, but who knew it would be such an emotional roller coaster! I must say though, the ups have far outweighed the downs. 🙂 Luckily, I have had a great support system of family and friends, encouraging me along the way. Special shout out to my run buddies (V & M) who have helped set the pace and pushed me through those extra miles. I have shared this before, but feel it’s appropriate to share again, as I always revert back to this piece from Tyler Knott Gregson, whenever I need some extra motivation. #571 reminds me of how good it all feels, even when it can be so tough. It helps encourage my body to keep going because it can, that it’s strong enough to get through the extra miles. Last week I had my longest run yet at 19.12 km in just under 2 hours (1:57) and damn did it feel good. I am hoping during Sunday’s race I will feel just as amazing and strong. Unfortunately, following that run I have been experiencing some Extensor Tendonitis for the first time. Good thing this week calls for tapering and rest before Sunday’s race. I’ll fit in a short run or two, a yoga session to stretch it out, some good fuel and lots of positive energy. My ultimate goal is to finish STWM at 2:05, but will be more than happy if I finish strong and under 2:10. I am geared up with all my race day essentials, necessary fuel and a killer playlist- I can’t wait to get out there! Stay tuned for my results. 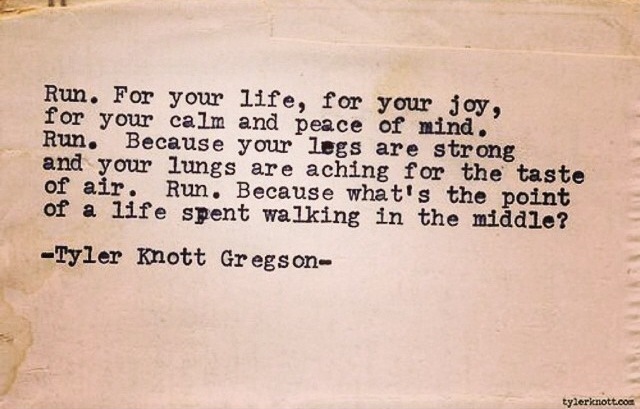 Good luck to all those running STWM on Sunday- Remember to run for your joy.